Shoppers can scan the barcode of makeup in the store, take a picture of themselves, and see how the makeup they selected looks on them in a digital mockup rendition. Increased sales, reduced shrink, and better availability are hoped-for benefits. We saw it at the National Retail Federation show last year (January 2009). Now Walmart has begun a 90-day trial of EZface’s Virtual Mirror. It was already being tried at three Boots stores (one of the largest cosmetic chains in the UK) as well as two Walmart stores in Arkansas since last year. EZface is an Israeli firm, founded by a young woman accountant who was frustrated with the process of buying cosmetics over the Internet because it was so hard to visualize how the makeup would actually look on her. So, she created a system that allows customers to try on the makeup virtually. In the internet version, the users upload a picture of themselves, select the cosmetic product(s) they want to try, and the software virtually “applies” the makeup to the uploaded photo. The software also shows a side-by-side or A/B comparison of images “before” (without makeup) and “after” (with makeup). 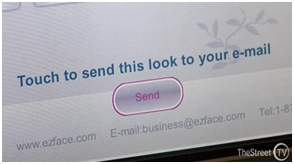 In addition to the internet version, EZface offers kiosk and mobile versions. The kiosk version has a built-in camera and barcode scanner. 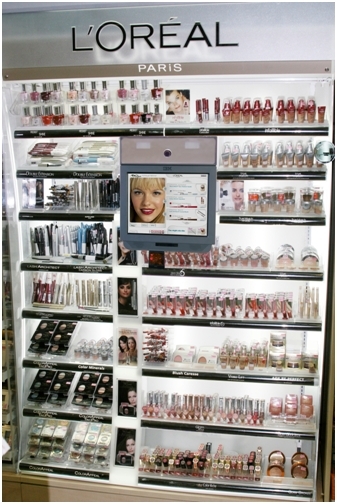 The users take a picture of themselves right there in the store using the kiosk’s built-in camera. They are asked to remove glasses and hats, and brush hair back from their face to get a clear shot. The customer then barcode scans whatever cosmetic item they want to try on (virtually) and the system shows what they would look like with the makeup on. The customer can optionally have those images emailed to themselves or to friends. The mobile version uses the built-in camera on their phone. There is some impressive technology behind this. Doing photorealistic simulations of makeup, hair color and eyewear products that are convincing is quite difficult. The software has to recognize and identify the precise boundaries of the features of the face (lips, eyes, eyelashes, etc. ), render true-to-life skin tone, and know how to “apply” the makeup realistically, accurately rendering not just the color but the physical properties of each type of makeup and how each will reflect light—so that for example glossy lipstick shines in a realistic manner. So, how well does it work? While it’s not perfect, most users say it is a reasonably accurate representation, which is noteworthy given the difficulty of the task. Walmart’s trial is being conducted at ten stores spanning a variety of demographic locations—three rural general markets, three suburban, two higher income, and two “empty-nester” markets. The trial includes a range of cosmetics, hair-coloring, and other facial treatments. Walmart is putting four units in each store; two units on each side of the aisle. It seems a fair amount of thought has been put into making the system simple and convenient. IBM provides the hardware, software, integration and support. Instead of using the store’s network, the kiosks are using Sprint’s 3G network, which means all the store has to provide is power. So installation and maintenance simplicity has also been an important consideration for Walmart in their implementation. The system can suggest pre-defined looks, designed by professional make-up artists, allowing cosmetic manufacturers to promote new products or seasonal trends. It can also suggest colors and combinations based on the customers’ “personal color profile,” which analyzes things like the color of their eyes and hair. This allows cross-selling to occur naturally in the process, potentially increasing the size of the sale. It seems possible that the suggestions made by the system could also be used to do demand shaping (à la Dell), encouraging shoppers to buy what is in stock, though Walmart has not specifically said it will do that. The retailer can see what things customers are looking at and trying, which colors are popular, and so forth, which should be a gold mine for merchandisers. This has the potential to give real insights into preferences, trends, unfulfilled demand, and other data about what the customer truly wants. 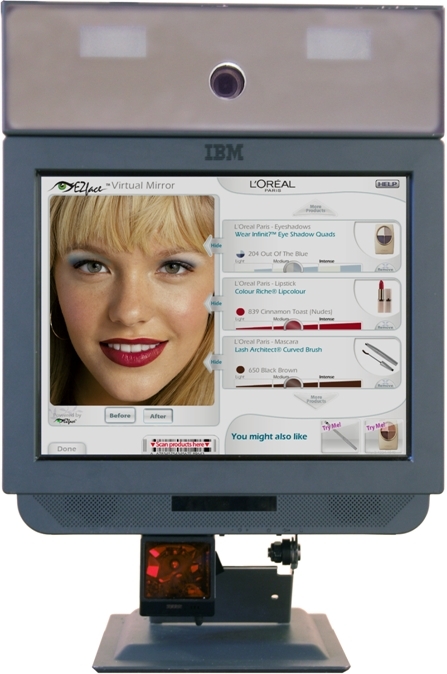 Furthermore, the Virtual Mirror software has been designed to enable adaptive marketing, such as making product recommendations based on the customers’ prior purchasing patterns and/or the overall brand strategy. The system is also able to correlate the customers’ interactions between all three platforms (web, kiosk, mobile). However, during the trial, Walmart does not intend to link specific images to specific customers nor save the email addresses, so they will not be testing out these customer-specific CRM capabilities. That aligns with Walmart’s existing no-loyalty card strategy. This system should reduce shrinkage, which can be up to 10% for cosmetics when people are trying on the actual makeup in the store. More importantly, it has the potential to increase sales. When people are trying on actual makeup, they tend to concentrate on the area of their face they are applying it to, rather than look at the full face. With the virtual mirror, they are shown the whole face. That combined with the power of the cross-sell suggestions, more items should make their way into the customers basket. You can bet that Walmart will be examining per store numbers to see if there is a bump in cosmetic sales. Walmart has the opportunity to make this a full multi-channel experience. Customers who send their made-up images via email will be able to view them on their phone or computer. However, it remains to be seen to what extent Walmart will leverage and coordinate the in-store kiosk, mobile and web experience for their customers. There are a lot of really cool technologies out there that never make it into widespread use. This is one that is actually getting some substantial real-world testing. If significant sales increases are seen in these trials, we will see a lot more Virtual Mirrors… and not just in Walmart. (Footnote) *This video shows the kiosk in action with commentary and more videos of it can be found on the EZface website.